Now, I hear you, and I see your point of view about a Vlog. “Videos are so much easier to watch and engage with” – media expert. They undoubtably have their place, but for now, this is not about being distracted by the ease in watching a video, and maybe, just maybe, my intention is not to engage with you but rather to encourage you to engage with yourself? Is that not more sustaining? And I don’t know, relevant? Say what you will, but words, however imperfect, grammatically incorrect or improper are powerful. Think about it, you’re reading my thinking in the sound of your voice? How crazy is that. Vlogs may be engaging, but words are intimate. How close do my thoughts now lie next to yours, and how soon will you not be able to distinguish between my voice and your own? Especially if you’ve been conditioned to only speak up with the support of a crowd. You see, it takes a strong mind to plough through words. Firstly to have the attention span and focus to do so, and secondly to get out on the other side of it and still have a unique voice, a sense of subject, identity and opinion of self that is not of a group. To read things that you don’t agree with, with as much ease and effortlessness as reading things that you do. To measure yourself, and the strength of your identity against conflicting ideals. It’s with this resistance, the push and pull of opinion that we develop strength and engrave our identity, and begin to distinguish who we are from everyone else, and what OUR thoughts truly sound like. Anyway, I digress. What I was actually intending on writing about is criticism and how we should welcome it. Criticism reflects the things we most often find wrong about ourselves. So when someone is kind enough to offer you theirs, it’s important that you don’t put up a fence of offense, but rather pay attention to the insight they’re offering about themselves. After all, it’s those “things” we’re self conscious about that we most often notice about other people isn’t it? We try and gauge other people’s reactions against our self perceptions. For example; if you’re trying to lose weight the first thing you notice about everyone else is whether or not they’ve gained or lost weight. Relationships. Whether you’re finding yours difficult, or finding it difficult to find “yours”, you’ll be closely observing and criticizing the way everyone else conducts theirs. This is why tabloids and Reality TV are a thing. We’re hoping to find some sort of relief in the comparison. Relief. For this reason, it’s often a good exercise to encourage criticism, to ask people to speak up of your flaw (or just listen in when they offer it freely to anyone within range) and pay attention to what they notice, and for you to then notice wherein lies their reflection. Also, when they catch onto your ability to recognize them in all of this, they’ll think twice about exposing themselves in this way again, and seek to find relief elsewhere. Anyway. Those of you who know me (even just a little bit) understand that I don’t take myself as seriously as it seems, and that I appreciate good humor, humility and banter over rigidity and pretentiousness. That I’m as much of a tease as I am a nerd. So, to the expert that keeps mocking absolutely everything I post, I appreciate your concern over my credibility and reputation and see it as your own. I also appreciate the fact that you won’t be able to mention reading this. Its almost human nature to get angry or hurt when receiving criticism, but like you said it should be welcomed in whichever form it comes in. Whether it’s a friend telling you what they think you’re doing wrong or an enemy mocking something you did. We are always looking to better ourselves and we cannot always be the judge of us, it is always beneficial to get an outside perspective of things we do. We take the good and bad together to improve what we do and that’s how we move forward. A mature outlook on accepting criticism, or rejecting it possibly. 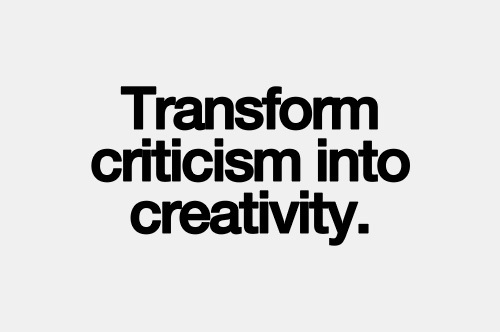 Processing criticism is one of those life skills the world could stand to benefit from.